At PMC, core elements work together to protect the public, employees, assets and the environment by proactively preventing damage to underground infrastructure. We have a comprehensive Damage Prevention program in place at PMC. The Program approaches public safety with the common goal to increase awareness and change unsafe behaviour in and around our pipelines. Expensive restoration costs and potential legal or regulatory action against you. 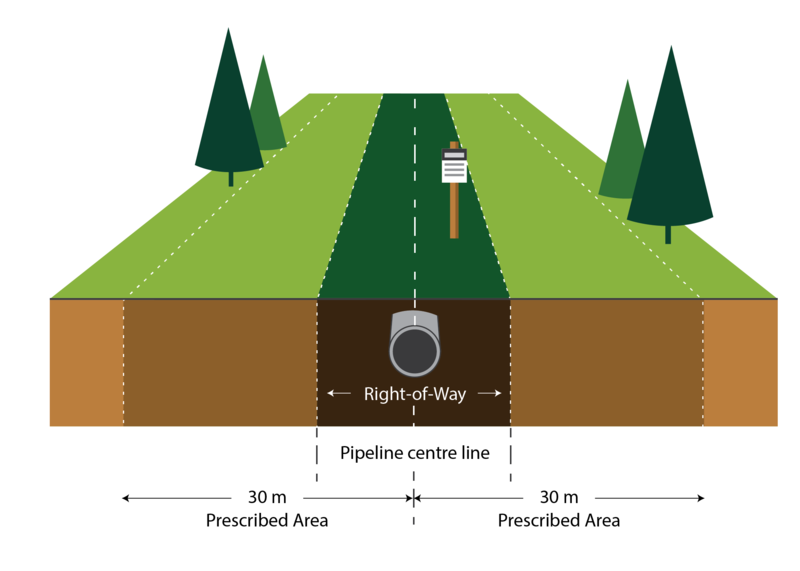 A Right-of-Way (ROW) is the strip of land above buried infrastructure that provides space to perform operational activities like pipeline maintenance, inspections and in some cases, allows access for responding to emergencies. Companies acquire the right to use the land for construction, operation, inspection and maintenance of their pipelines. ROW’s identify an area where certain activities are prohibited to protect the public and the integrity of the pipeline. They are typically cleared of trees and most vegetation, as well as building and other structures, and are always clearly marked with warning signs. Federal and various provincial regulations require pipeline companies to place warning signs along their pipeline route. The most visible locations are chosen for warning signs – along highways, at road, railway and water crossings and other prominent locations. Warning signs clearly and continuously mark the approximate location of underground assets. It’s important to remember that these markers only show the estimated location of a pipeline, and they do not indicate the depth at which the asset is buried. Whether you are planning a major construction project, or planting a garden, to ensure your safety you must Click or Call Before You Dig before you start to find out where buried networks are as they could pose a serious risk to the public, the environment and the infrastructure itself. Placing a One-Call is easy, free and will guarantee your ground disturbance activities get off on the right foot. When you contact your local One-Call Center, project information is gathered which is used to inform buried infrastructure owners of your activity. Within a few days, infrastructure owners will be out to locate and mark their underground assets. If you ever suspect a problem related to PMC’s pipelines or facilities, or make even slight contact with one of our assets during your work please call PMC’s 24-hour Emergency Response number at 1-866-875-2554.